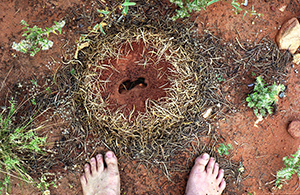 In the Footsteps of Stuart is a photo-narrative exhibition developed over several journeys in Central Australia (and one to England) between 2003 and 2010 which presents aspects of the physical and cultural landscape. 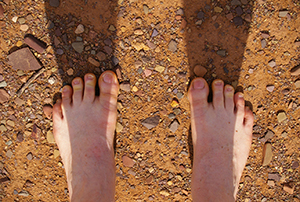 Photographs of iconic central Australian landscapes are accompanied by images of my bare white feet where I stood, incongruous on the hot, stoney, prickly, and sometimes muddy, ground. 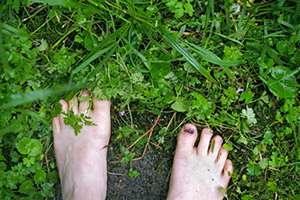 The images are accompanied by postcards home, telling intimate stories of people and place, of evolving understandings. The exhibition comprises thirty-four sets of images and postcards and has been presented at the South Australian Museum, 2005; Art Gallery of Western Australia–Geraldton Regional Gallery, 2005; Port Pirie Regional Gallery, 2007; Murray Bridge Regional Gallery, 2007; Gallery Kubo-Kuxta, San Sebastian, Spain, 2010; Flinders University Art Museum, Adelaide, 2011. For San Sebastian (Donostia in Basque) all text was translated into Spanish and Basque. 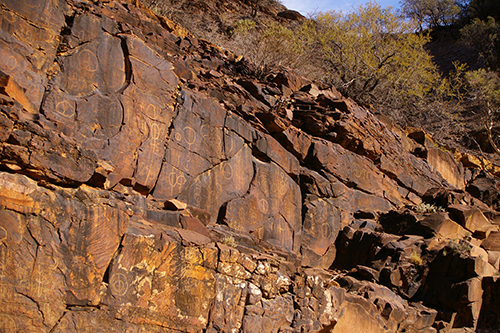 This magnificent galley of rock art is thousands of years old. It’s in Chambers Gorge in Adnyamathanha people’s country, they call it Marlawahinha Inbiri. I don’t know all the symbolism in the engravings but that is OK. To fully understand another culture takes time and commitment, and you also have to earn the right to knowledge. I am amazed by the antiquity of the human culture here, and how we have the oldest continuous culture in the world. Unfortunately we still do not fully appreciate and respect our Aboriginal peoples and what we have. Just found out that Adnyamathanha literally means ‘rock people of the hills’. To get to the rock peckings is by a walk along the dry Mount Chambers Creek which gives time to appreciate the country, to approach with respect, and then leave in quiet contemplation. I wonder about the people walking here for tens of thousands of years. 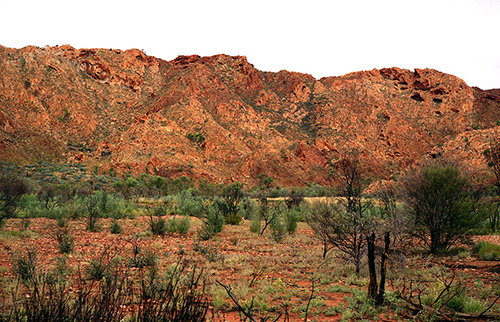 Gosses Bluff is 160km west of Alice. We first saw it from a distance and its a powerful feature rising from the flat plains. In geological terms it was formed 142 million years ago when a 600m diameter comet hit the earth, forming a crater 20km across. It’s now eroded down to 5km in diameter. Another story is from the Western Arrarnta who call it Tnurrala. It was formed when the women danced across the sky as the Milky Way amewarra. During the dance a mother put her baby to rest in its turna (wooden carrier). The turna toppled over the edge of the dancing area and crashed to earth where it became the circular rock walls. Amazing how Arrarnta also have an impact story to explain the crater even though it happened millions of years ago. Gosses Bluff está 160 km. al oeste de Alice. Lo vimos por primera vez desde una cierta distancia y es un enclave poderoso que se eleva desde la llanura. En términos geológicos se formó hace 142 millones de años cuando un cometa de 600 metros de diámetro chocó contra la tierra formando un cráter de 20 km. de ancho. Se ha ido erosionando hasta los 5 kilómetros de diámetro que tiene en la actualidad. Otra historia es la que cuentan los Western Arrarnta que lo llaman Tnurrala. Se formó cuando las mujeres bailaban por el firmamento como la Vía Láctea amewarra. Durante el baile, una madre puso a su bebé a descansar en su turna (carro de madera). El carro volcó y cayó por el borde de la zona de baile y chocó contra la tierra donde se convirtió en las paredes circulares de piedra. Es sorprendente cómo los Arrarnta también tienen una historia que trata de un choque para explicar el cráter aun cuando sucedió hace millones de años. Gosses Bluff 160 km-ra dago Alicetik mendebaldera, lautadaren erdian goraturik, eta urrutitik ikusten da. Ikuspegi geologikotik, duela 142 milioi urte sortu zen 600 m-ko diametroko kometa batek lurraren kontra talka egin eta 20 km-ko zabalerako kraterra sortu zuenean. Denboraren joanak erosionatu egin du, eta gaur egun haren diametroa 5 km ingurukoa da. Western Arrarnta herriak Tnurrala deitzen dio, eta honela azaltzen du haren sorrera: emakume talde bat izarrartean Amewarra izeneko zirkulu batean dantzan ari zela, ama batek egurrezko gurditxo batean utzi zuen bere umea; halako batean, gurdia irauli, erori eta lurraren kontra talka egin zuen harrizko horma zirkularrak sortuz. Harrigarria da nola erabiltzen duten bertakoek talka baten istorioa duela milioika urte sortutako kraterra azaltzeko. Camped at the entrance to Palm Valley Alyape. Heading along Palm Creek into the Valley proper tomorrow, just glimpses from here. Amazing how the surrounding landscape is semi-arid but there’s this lost world of lushness from antiquity. Almost expect to see a dinosaur rather than a dingo. 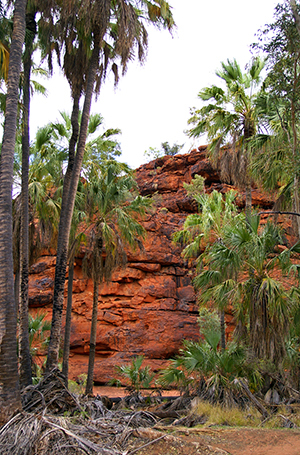 Nearest relatives of the cabbage palms arrangkeye are at Millstream in northern W.A., which we hope to get to. Only 16 km from Hermannsburg Ntaria but the track in follows the bed of the Finke River Lhere pirnte and is definitely 4WD, rocky in some parts and sandy in others, bumped around a bit. Tour drivers must get sick of it, quite a slow drive. Ernest Giles first whitefella here in 1872 and called it Glen of the Palms. He was overawed at his discovery. Don’t know why name changed? Here I am at Stuart’s grave. 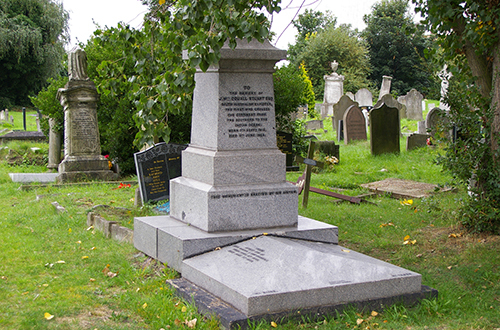 It’s an unassuming memorial in a quiet corner of Kensal Green Cemetery in London. It was difficult to find the grave, there are no signs indicating its location. His burial in 1866 was a simple ceremony, only a few mourners, no State funeral or fanfare. I was thinking that if the Aboriginal people had hindered his explorations, or even killed him, it would have delayed settlement of the Australian interior possibly by decades. If he hadn’t found the water and laid the track, history could have been so much different. Aboriginal people were generous in accommodating those strange intruders, only really taking defensive action when they or their land were abused, as when their meagre water supplies were consumed by the expedition’s horses. PS. It was a really creepy cemetery. 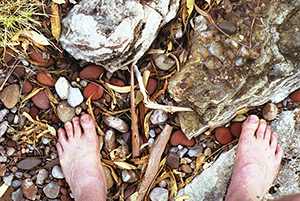 Bare Footed – Bare Hearted is a photo-narrative exhibition evolving from a journey to Ireland. 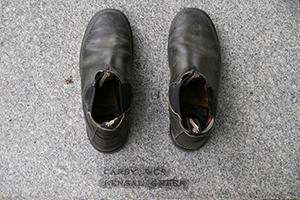 Comprising several sets of images and postcards, the work was presented in Celtic Roots, an exhibition by artists of Celtic heritage as part of the Celtica Festival, Port Adelaide. With a name like Gavin Damien Francis (Joseph) Malone my genetic and cultural DNA is fairly obvious. I am though of this place, South Australia, I started my life in the small country town of Cambrai (known as Rhinevilla until 1917) in the rain shadow of the Mt Lofty Ranges. I was a Mallee Mick, and that dry country is still a comfortable place for me. In 2008 I visited Ireland as part of a journey to North Africa and Europe. 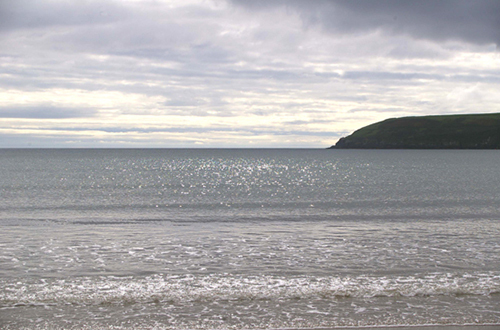 I have no desire to return to many of the European places visited, but to Ireland I do. In County Clare I met and stayed with distant cousins, even after the dislocation over 130 years ago. There has been ongoing family contact and after all that time, there was an easy connection. My feet are being washed by the Atlantic, too cold for a swim. The beach is deserted; my thoughts drift as I gaze to the sea. It is past here that our ancestors sailed on their journey to South Australia. I’m at Ardmore just along the coast from the port of Cobh, or Queenstown as it was known when named after you know who. Coincidently, I happened to visit a grand (colonising) manor with a toilet built especially for Her Royal Pee ‘n Poo. Cost a bloody fortune to build for an overnight stay. Typical!! Queenstown was the port of departure for millions. I wonder what sadness, anticipations and fears were held by the potato diaspora, that great forced exodus after An Angor Mor, The Great Hunger. Our ancestors were part of that. Its nearly 160 years now since our great, great grandparents, John and Mary Malone left County Clare in the 1850s, Mary was a Costello. And 134 years since Annie O’Brien, our great grandmother, also left Clare in 1875. She married Martin, their Adelaide born son, in 1882. PS. I’ve been staying with cousin Ted and family, Ailbhe, Éinne and Darach, at Dungarven. They are Irish speaking and it’s beautiful to hear the spoken language. They kindly speak English when I’m around. PPS. Can you see the map of Australia in the swirl at my feet? No touch ups either. I’m in the ruins of Killeany Church standing at the grave, located within the church, of our great, great grandparents, John and Margaret O’Brien. They’re buried in the grave of a relative, Honora Neylon, but not recorded on the slab gravestone. I wonder why? According to tradition, St Edna founded a church on this site in the 5th Century. It’s not far from Cahermerkerla and the family home John O’Brien built in the early 1850s. The house is still in the family and I’m staying there several days. Not something I ever imagined, staying in the house where our great grandmother Annie was born in 1858. Also never imagined I’d stand on the spot a few years ago where the British exploded the first atomic bomb in Australia at Emu. A bit different but still weird. 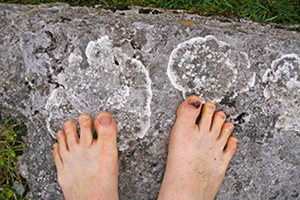 Went for a half-day walk on the Burren with Brede, cousin John’s wife, and her walking group. It’s a hilly limestone area and because the limestone absorbs heat in summer it’s used for cattle grazing in winter. The area has been occupied for at least 6000 years and farmed since Neolithic times. Still though has the most varied flora in Europe. Has been called the ‘largest and most remarkable rock garden in the world’, plants growing in cracks. 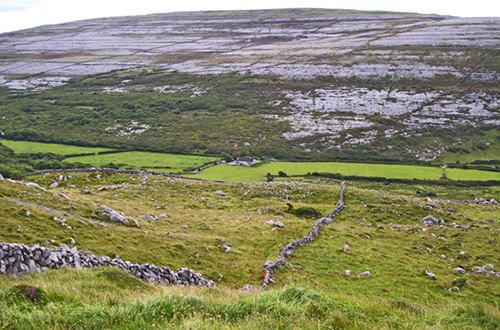 In a brochure on the Burren it is said to be ‘as mystical as Ayres Rock’. Language a bit old i.e. Uluru, but a nice crossover with Australia. It’s O’Brien country, our ancestor’s country, and the Malone’s weren’t from far away. Funny how I’ve used limestone in my own work for all these years. Cultural genetics?? 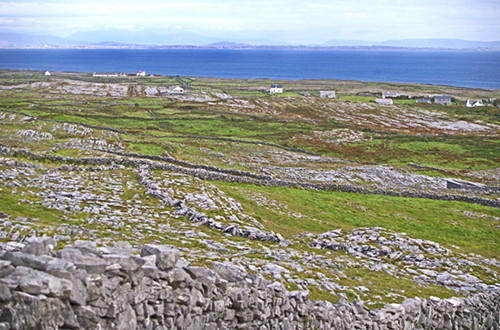 I’m on Inishmore, one of the Aran Islands off the coast of Clare and Galway. The saying ‘daylight robbery’ came from here after the introduction of a window tax by the English. 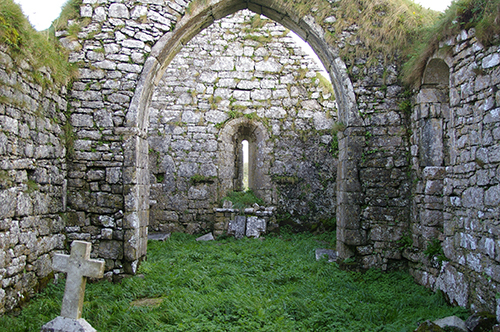 Three or more windows were subject to a tax so the houses only had two, along with a door where the top half opened to let in the light and air. The tax lasted for thirty years but the building style lasted a hundred, just in case the English reintroduced the tax! Came out here by boat from Doolin, one of those tiny Irish villages that traditionally harvests both land and sea. Coast along there and the Cliffs of Moher are a subdued stunning, reminds me of Deep Creek, but with different vegetation. PS. Back from Galway. Decided to take a back route along the coast and suddenly all the road signs were in Gaelic. Got a bit ‘geographically challenged’, you know I never get lost. Completely went the wrong way and had to ask directions at a shop.